Ortho images depict the earth’s surface without distortion and thus on a uniform scale across its entire expanse. They frequently serve as a basis to be superimposed with map elements in GIS programmes. However, ortho images can also be used for area analyses (e.g. changes in usable areas, vegetation development or urban sprawl), for instance. 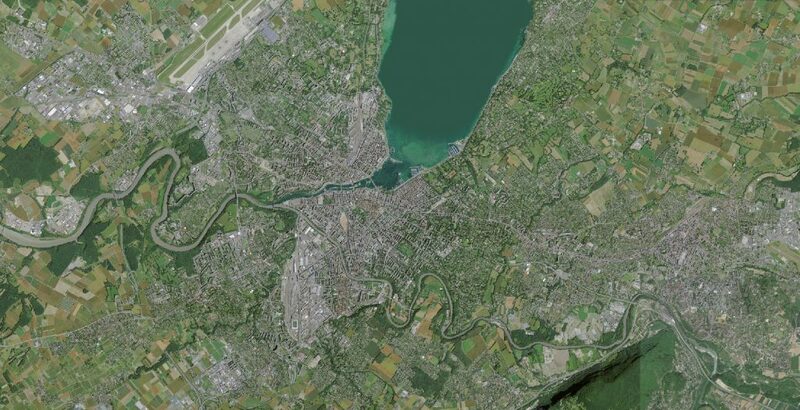 The dataset SWISSIMAGE comprises such distortion-free, true to scale, digital colour aerial images across the whole of Switzerland. The dataset is available on geodata4edu.ch in different time spans (from 1998) and resolutions (up to 25 centimetres) in raster format. Ortho images are not only produced based on aerial photographs, but also from satellite images. The LANDSAT mosaic of Switzerland consists of 20 individual photographs taken by the American satellite Landsat 5 between 1990 and 1995. The considerably lower ground resolution of 25 metres compared to SWISSIMAGE enables more regional overviews (scale of 1:100 000 or smaller) than detailed analyses.